We're under attack from climate change-and our only hope is to mobilize like we did in WWII. It's not that global warming is like a world war. It is a world war. And we are losing. Defeating the Nazis required more than brave soldiers. It required a wholesale industrial retooling. In this war we're in-the war that physics is fighting hard, and that we aren't-winning slowly is the same as losing. In the North this summer, a devastating offensive is underway. Enemy forces have seized huge swaths of territory; with each passing week, another 22,000 square miles of Arctic ice disappears. Experts dispatched to the battlefield in July saw little cause for hope, especially since this siege is one of the oldest fronts in the war. "In 30 years, the area has shrunk approximately by half," said a scientist who examined the onslaught. "There doesn't seem anything able to stop this." In the Pacific this spring, the enemy staged a daring breakout across thousands of miles of ocean, waging a full-scale assault on the region's coral reefs. In a matter of months, long stretches of formations like the Great Barrier Reef-dating back past the start of human civilization and visible from space-were reduced to white bone-yards. Day after day, week after week, saboteurs behind our lines are unleashing a series of brilliant and overwhelming attacks. In the past few months alone, our foes have used a firestorm to force the total evacuation of a city of 90,000 in Canada, drought to ravage crops to the point where southern Africans are literally eating their seed corn, and floods to threaten the priceless repository of art in the Louvre. The enemy is even deploying biological weapons to spread psychological terror: The Zika virus, loaded like a bomb into a growing army of mosquitoes, has shrunk the heads of newborn babies across an entire continent; panicked health ministers in seven countries are now urging women not to get pregnant. And as in all conflicts, millions of refugees are fleeing the horrors of war, their numbers swelling daily as they're forced to abandon their homes to escape famine and desolation and disease. It's not that global warming is like a world war. It is a world war. And we are losing. We're used to war as metaphor: the war on poverty, the war on drugs, the war on cancer. Usually this is just a rhetorical device, a way of saying, "We need to focus our attention and marshal our forces to fix something we don't like." But this is no metaphor. By most of the ways we measure wars, climate change is the real deal: Carbon and methane are seizing physical territory, sowing havoc and panic, racking up casualties, and even destabilizing governments. (Over the past few years, record-setting droughts have helped undermine the brutal strongman of Syria and fuel the rise of Boko Haram in Nigeria.) It's not that global warming is like a world war. It is a world war. Its first victims, ironically, are those who have done the least to cause the crisis. But it's a world war aimed at us all. And if we lose, we will be as decimated and helpless as the losers in every conflict--except that this time, there will be no winners, and no end to the planetwide occupation that follows. To answer those questions-to assess, honestly and objectively, our odds of victory in this new world war-we must look to the last one. For four years, the United States was focused on a single, all-consuming goal, to the exclusion of any other concern: defeating the global threat posed by Germany, Italy, and Japan. Unlike Adolf Hitler, the last force to pose a planetwide threat to civilization, our enemy today is neither sentient nor evil. But before the outbreak of World War II, the world's leaders committed precisely the same mistake we are making today-they tried first to ignore their foe, and then to appease him. Eager to sidestep the conflict, England initially treated the Nazis as rational actors, assuming that they would play by the existing rules of the game. That's why Neville Chamberlain came home from Munich to cheering crowds: Constrained by Britain's military weakness and imperial overreach, he did what he thought necessary to satisfy Hitler. Surely, the thinking went, the dictator would now see reason. But Hitler was playing by his own set of rules, which meant he had contempt for the political "realism" of other leaders. (Indeed, it meant their realism wasn't.) Carbon and methane, by contrast, offer not contempt but complete indifference: They couldn't care less about our insatiable desires as consumers, or the sunk cost of our fossil fuel infrastructure, or the geostrategic location of the petro-states, or any of the host of excuses that have so far constrained our response to global warming. The world came back from signing the climate accord in Paris last December exactly as Chamberlain returned from Munich: hopeful, even exhilarated, that a major threat had finally been tackled. Paul Krugman, summing up the world's conventional wisdom, post-Paris, concluded that climate change "can be avoided with fairly modest, politically feasible steps. You may want a revolution, but we don't need one to save the planet." All it would take, he insisted, is for America to implement Obama's plan for clean power, and to continue "guiding the world as a whole toward sharp reductions in emissions," as it had in Paris. This is, simply put, as wrong as Chamberlain's "peace in our time." Even if every nation in the world complies with the Paris Agreement, the world will heat up by as much as 3.5 degrees Celsius by 2100-not the 1.5 to 2 degrees promised in the pact's preamble. And it may be too late already to meet that stated target: We actually flirted with that 1.5 degree line at the height of the El Nio warming in February, a mere 60 days after the world's governments solemnly pledged their best efforts to slow global warming. Our leaders have been anticipating what French strategists in World War II called the guerre du longue durée, even as each new edition of Science or Nature makes clear that climate change is mounting an all-out blitzkrieg, setting new record highs for global temperatures in each of the past 14 months. Not long after Paris, earth scientists announced that the West Antarctic ice sheet is nowhere near as stable as we had hoped; if we keep pouring greenhouse gases into the atmosphere, it will shed ice much faster than previous research had predicted. At an insurance industry conference in April, a federal official described the new data as "an OMG thing." "The long-term effect," The New York Times reported, "would likely be to drown the world's coastlines, including many of its great cities." If Nazis were the ones threatening destruction on such a global scale today, America and its allies would already be mobilizing for a full-scale war. The Antarctic research did contain, as the Times reported, one morsel of good news. Yes, following the Paris accord would doom much of the Antarctic-but a "far more stringent effort to limit emissions of greenhouse gases would stand a fairly good chance of saving West Antarctica from collapse." What would that "far more stringent effort" require? For years now, climate scientists and leading economists have called for treating climate change with the same resolve we brought to bear on Germany and Japan in the last world war. In July, the Democratic Party issued a platform that called for a World War II-type national mobilization to save civilization from the "catastrophic consequences" of a "global climate emergency." In fact, Hillary Clinton's negotiators agreed to plans for an urgent summit "in the first hundred days of the next administration" where the president will convene "the world's best engineers, climate scientists, policy experts, activists, and indigenous communities to chart a course to solve the climate crisis." As it happens, American scientists have been engaged in a quiet but concentrated effort to figure out how quickly existing technology can be deployed to defeat global warming; a modest start, in effect, for a mighty Manhattan Project. Mark Z. Jacobson, a professor of civil and environmental engineering at Stanford University and the director of its Atmosphere and Energy Program, has been working for years with a team of experts to calculate precisely how each of the 50 states could power itself from renewable resources. The numbers are remarkably detailed: In Alabama, for example, residential rooftops offer a total of 59.7 square kilometers that are unshaded by trees and pointed in the right direction for solar panels. Taken together, Jacobson's work demonstrates conclusively that America could generate 80 to 85 percent of its power from sun, wind, and water by 2030, and 100 percent by 2050. In the past year, the Stanford team has offered similar plans for 139 nations around the world. The research delves deep into the specifics of converting to clean energy. Would it take too much land? The Stanford numbers show that you would need about four-tenths of one percent of America's landmass to produce enough renewable energy, mostly from sprawling solar power stations. Do we have enough raw materials? "We looked at that in some detail and we aren't too worried," says Jacobson. "For instance, you need neodymium for wind turbines-but there's seven times more of it than you'd need to power half the world. Electric cars take lithium for batteries-but there's enough lithium just in the known resources for three billion cars, and at the moment we only have 800 million." 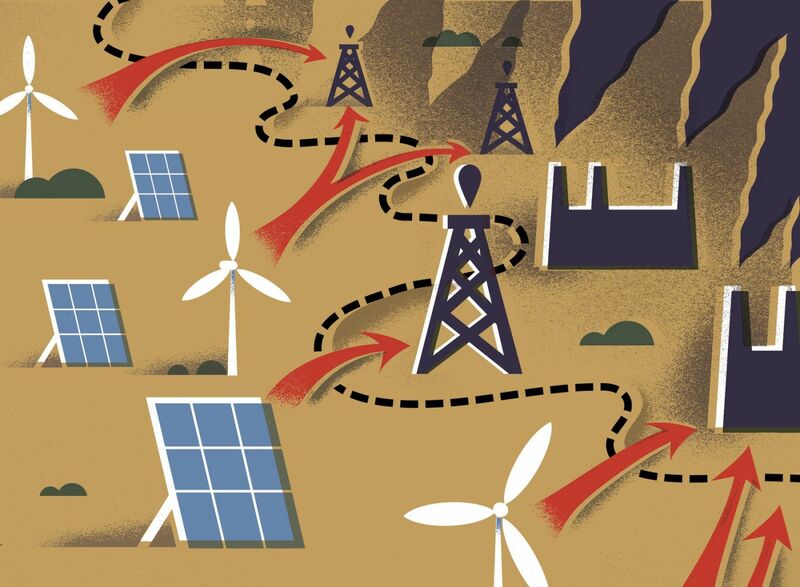 To make the Stanford plan work, you would need to build a hell of a lot of factories to turn out thousands of acres of solar panels, and wind turbines the length of football fields, and millions and millions of electric cars and buses. But here again, experts have already begun to crunch the numbers. Tom Solomon, a retired engineer who oversaw the construction of one of the largest factories built in recent years-Intel's mammoth Rio Rancho semiconductor plant in New Mexico-took Jacobson's research and calculated how much clean energy America would need to produce by 2050 to completely replace fossil fuels. The answer: 6,448 gigawatts. "Last year we installed 16 gigawatts of clean power," Solomon says. "So at that pace, it would take 405 years. Which is kind of too long." So Solomon did the math to figure out how many factories it would take to produce 6,448 gigawatts of clean energy in the next 35 years. He started by looking at SolarCity, a clean-energy company that is currently building the nation's biggest solar panel factory in Buffalo. "They're calling it the giga-factory," Solomon says, "because the panels it builds will produce one gigawatt worth of solar power every year." Using the SolarCity plant as a rough yardstick, Solomon calculates that America needs 295 solar factories of a similar size to defeat climate change-roughly six per state-plus a similar effort for wind turbines. Building these factories doesn't require any new technology. In fact, the effort would be much the same as the one that Solomon oversaw at Intel's semiconductor factory in New Mexico: Pick a site with good roads and a good technical school nearby to supply the workforce; find trained local contractors who can deal with everything from rebar to HVAC; get the local permits; order long-lead-time items like I-beam steel; level the ground and excavate; lay foundations and floors; build walls, columns, and a roof; "facilitate each of the stations for factory machine tooling with plumbing, piping, and electrical wiring"; and train a workforce of 1,500. To match the flow of panels needed to meet the Stanford targets, in the most intense years of construction we need to erect 30 of these solar panel factories a year, plus another 15 for making wind turbines. "It's at the upper end of what I could possibly imagine," Solomon says. 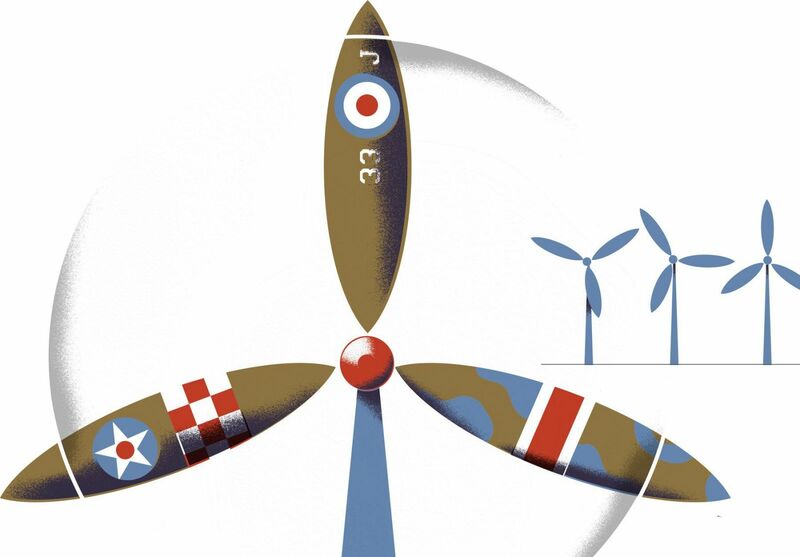 Turning out more solar panels and wind turbines may not sound like warfare, but it's exactly what won World War II: not just massive invasions and pitched tank battles and ferocious aerial bombardments, but the wholesale industrial retooling that was needed to build weapons and supply troops on a previously unprecedented scale. Defeating the Nazis required more than brave soldiers. It required building big factories, and building them really, really fast. In 1941, the world's largest industrial plant under a single roof went up in six months near Ypsilanti, Michigan; Charles Lindbergh called it the "Grand Canyon of the mechanized world." Within months, it was churning out a B-24 Liberator bomber every hour. Bombers! Huge, complicated planes, endlessly more intricate than solar panels or turbine blades-containing 1,225,000 parts, 313,237 rivets. Nearby, in Warren, Michigan, the Army built a tank factory faster than they could build the power plant to run it-so they simply towed a steam locomotive into one end of the building to provide steam heat and electricity. That one factory produced more tanks than the Germans built in the entire course of the war. It wasn't just weapons. In another corner of Michigan, a radiator company landed a contract for more than 20 million steel helmets; not far away, a rubber factory retooled to produce millions of helmet liners. The company that used to supply fabrics for Ford's seat cushions went into parachute production. Nothing went to waste--when car companies stopped making cars for the duration of the fighting, GM found it had thousands of 1939 model-year ashtrays piled up in inventory. So it shipped them out to Seattle, where Boeing put them in long-range bombers headed for the Pacific. Pontiac made anti-aircraft guns; Oldsmobile churned out cannons; Studebaker built engines for Flying Fortresses; Nash-Kelvinator produced propellers for British de Havillands; Hudson Motors fabricated wings for Helldivers and P-38 fighters; Buick manufactured tank destroyers; Fisher Body built thousands of M4 Sherman tanks; Cadillac turned out more than 10,000 light tanks. And that was just Detroit-the same sort of industrial mobilization took place all across America. According to the conventional view of World War II, American business made all this happen simply because it rolled up its sleeves and went to war. As is so often the case, however, the conventional view is mostly wrong. Yes, there are endless newsreels from the era of patriotic businessmen unrolling blueprints and switching on assembly lines-but that's largely because those businessmen paid for the films. Their PR departments also put out their own radio serials with titles like "Victory Is Their Business," and "War of Enterprise," and published endless newspaper ads boasting of their own patriotism. In reality, many of America's captains of industry didn't want much to do with the war until they were dragooned into it. Henry Ford, who built and managed that Ypsilanti bomber plant, was an America Firster who urged his countrymen to stay out of the war; the Chamber of Commerce (now a leading opponent of climate action) fought to block FDR's Lend-Lease program to help the imperiled British. "American businessmen oppose American involvement in any foreign war," the Chamber's president explained to Congress. Luckily, Roosevelt had a firm enough grip on Congress to overcome the Chamber, and he took the lead in gearing up America for the battles to come. Mark Wilson, a historian at the University of North Carolina at Charlotte, has just finished a decade-long study of the mobilization effort, entitled Destructive Creation. It details how the federal government birthed a welter of new agencies with names like the War Production Board and the Defense Plant Corporation; the latter, between 1940 and 1945, spent $9 billion on 2,300 projects in 46 states, building factories it then leased to private industry. By war's end, the government had a dominant position in everything from aircraft manufacturing to synthetic rubber production. "It was public capital that built most of the stuff, not Wall Street," says Wilson. "And at the top level of logistics and supply-chain management, the military was the boss. They placed the contracts, they moved the stuff around." The feds acted aggressively-they would cancel contracts as war needs changed, tossing factories full of people abruptly out of work. If firms refused to take direction, FDR ordered many of them seized. Though companies made money, there was little in the way of profiteering-bad memories from World War I, Wilson says, led to "robust profit controls," which were mostly accepted by America's industrial tycoons. In many cases, federal authorities purposely set up competition between public operations and private factories: The Portsmouth Naval Shipyard built submarines, but so did Electric Boat of Groton, Connecticut. "They were both quite impressive and productive," Wilson says. "Usually, when people from different worlds are dealing with each other, they get into conflicts and then dig in their heels deeper," Berk says. "But because the stakes are so high and it's moving so fast, no one doubts that if you don't get a handle on this battle in the Atlantic, then the immediate consequences will be really grave. So they're willing to do this kind of pragmatic trial and error. They start to see that `I can't dig in my heels--I need this other person to learn from.'" In the face of a common enemy, Americans worked together in a way they never had before. That attitude quickly reset after the war, of course; solidarity gave way to the biggest boom in personal consumption the world had ever seen, as car-packed suburbs sprawled from every city and women were retired to the kitchen. Business, eager to redeem its isolationist image and shake off New Deal restrictions, sold itself as the hero of the war effort, patriotic industrialists who had overcome mountains of government red tape to get the job done. And the modest "operations researchers," who had entered and learned from the real world when they managed radar development during the war, retreated to their ivory towers and became much grander "systems analysts" once the conflict ended. Robert McNamara, a former Ford executive, brought an entire wing of the Rand Corporation to the Defense Department during the Kennedy administration, where the think-tank experts promptly privatized most of the government shipyards and plane factories, and used their out-of-touch computer models to screw up government programs like Model Cities, the ambitious attempt at urban rehabilitation during the War on Poverty. "The systems analysts completely took over," Berk says, "and the program largely failed for that reason." Today we live in the privatized, siloed, business-dominated world that took root under McNamara and flourished under Reagan. The actual wars we fight are marked by profiteering, and employ as many private contractors as they do soldiers. Our spirit of social solidarity is, to put it mildly, thin. (The modern-day equivalent of Father Coughlin is now the Republican candidate for president.) So it's reasonable to ask if we can find the collective will to fight back in this war against global warming, as we once fought fascism. There are powerful forces, of course, that stand in the way of a full-scale mobilization. If you add up every last coal mine and filling station in the world, governments and corporations have spent $20 trillion on fossil fuel infrastructure. 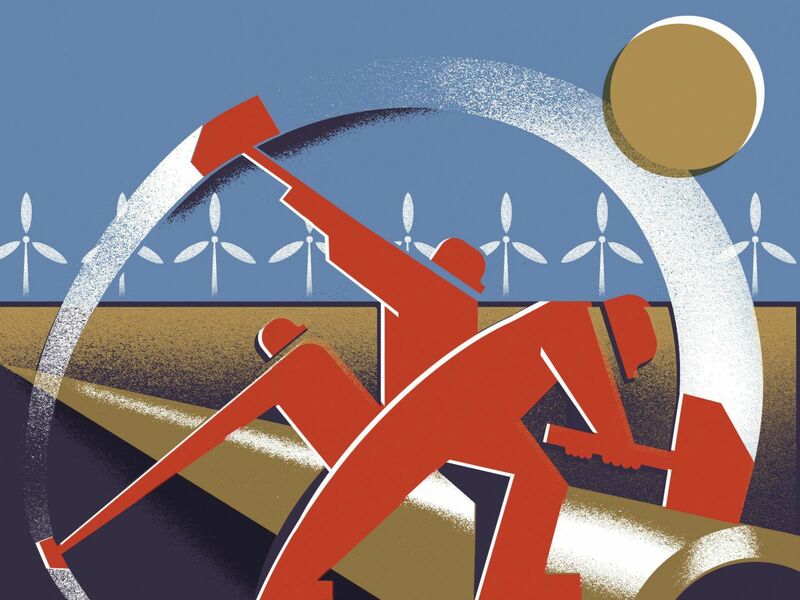 "No country will walk away from such investments," writes Vaclav Smil, a Canadian energy expert. As investigative journalists have shown over the past year, the oil giant Exxon knew all about global warming for decades-yet spent millions to spread climate-denial propaganda. The only way to overcome that concerted opposition-from the very same industrial forces that opposed America's entry into World War II-is to adopt a wartime mentality, rewriting the old mindset that stands in the way of victory. "The first step is we have to win," says Jonathan Koomey, an energy researcher at Stanford University. "That is, we have to have broad acceptance among the broader political community that we need urgent action, not just nibbling around the edges, which is what the D.C. crowd still thinks." That political will is starting to build, just as it began to gather in the years before Pearl Harbor. A widespread movement has killed off the Keystone pipeline, stymied Arctic drilling, and banned fracking in key states and countries. As one oil industry official lamented in July, "The `keep-it-in-the-ground' campaign" has "controlled the conversation." This resembles, at least a little, the way FDR actually started gearing up for war 18 months before the "date which will live in infamy." The ships and planes that won the Battle of Midway six months into 1942 had all been built before the Japanese attacked Hawaii. "By the time of Pearl Harbor," Wilson says, "the government had pretty much solved the problem of organization. After that, they just said, `We're going to have to make twice as much.'" Pearl Harbor did make individual Americans willing to do hard things: pay more in taxes, buy billions upon billions in war bonds, endure the shortages and disruptions that came when the country's entire economy converted to wartime production. Use of public transit went up 87 percent during the war, as Naomi Klein points out in This Changes Everything; 40 percent of the nation's vegetables were grown in victory gardens. For the first time, women and minorities were able to get good factory jobs; Rosie the Riveter changed our sense of what was possible. Without a Pearl Harbor, in fact, there was only so much even FDR could have accomplished. So far, there has been no equivalent in the climate war-no single moment that galvanizes the world to realize that nothing short of total war will save civilization. Perhaps the closest we've come to FDR's "date of infamy" speech-and it wasn't all that close-was when Bernie Sanders, in the first debate, was asked to name the biggest security threat facing the planet. "Climate change," he replied-prompting all the usual suspects to tut-tut that he was soft on "radical Islamic terrorism." Then, in the second debate, the question came up again, a day after the Paris massacres. "Do you still believe that?" the moderator asked, in gotcha mode. "Absolutely," replied Sanders, who then proceeded to give an accurate account of how record drought will lead to international instability. Had he won, it's possible that Bernie could have combined his focus on jobs and climate and infrastructure into some kind of overarching effort that really mattered-he was, after all, the presidential candidate most comfortable with big government since FDR. Donald Trump, of course, will dodge this war just as he did Vietnam. He thinks (if that's actually the right verb) that climate change is a hoax manufactured by the Chinese, who apparently in their Oriental slyness convinced the polar ice caps to go along with their conspiracy. Clinton's advisers originally promised there would be a "climate war room" in her White House, but then corrected the record: It would actually be a "climate map room," which sounds somewhat less gung ho. In fact, one of the lowest points in my years of fighting climate change came in late June, when I sat on the commission appointed to draft the Democratic Party platform. (I was a Sanders appointee, alongside Cornel West and other luminaries.) At 11 p.m. on a Friday night, in a mostly deserted hotel ballroom in St. Louis, I was given an hour to offer nine amendments to the platform to address climate change. More bike paths passed by unanimous consent, but all the semi-hard things that might begin to make a real difference-a fracking ban, a carbon tax, a prohibition against drilling or mining fossil fuels on public lands, a climate litmus test for new developments, an end to World Bank financing of fossil fuel plants-were defeated by 7-6 tallies, with the Clinton appointees voting as a bloc. They were quite concerned about climate change, they insisted, but a "phased-down" approach would be best. There was the faintest whiff of Munich about it. Like Chamberlain, these were all good and concerned people, just the sort of steady, evenhanded folks you'd like to have leading your nation in normal times. But they misunderstood the nature of the enemy. Like fascism, climate change is one of those rare crises that gets stronger if you don't attack. In every war, there are very real tipping points, past which victory, or even a draw, will become impossible. And when the enemy manages to decimate some of the planet's oldest and most essential physical features-a polar ice cap, say, or the Pacific's coral reefs-that's a pretty good sign that a tipping point is near. In this war that we're in-the war that physics is fighting hard, and that we aren't-winning slowly is exactly the same as losing. To my surprise, things changed a couple weeks later, when the final deliberations over the Democratic platform were held in Orlando. While Clinton's negotiators still wouldn't support a ban on fracking or a carbon tax, they did agree we needed to "price" carbon, that wind and sun should be given priority over natural gas, and that any federal policy that worsened global warming should be rejected. Maybe it was polls showing that Bernie voters-especially young ones-have been slow to sign on to the Clinton campaign. Maybe the hottest June in American history had opened some minds. But you could, if you squinted, create a hopeful scenario. Clinton, for instance, promised that America will install half a billion solar panels in the next four years. That's not so far off the curve that Tom Solomon calculates we need to hit. And if we do it by building solar factories of our own, rather than importing cheap foreign-made panels, we'll be positioning America as the world's dominant power in clean energy, just as our mobilization in World War II ensured our economic might for two generations. If we don't get there first, others will: Driven by anger over smog-choked cities, the Chinese have already begun installing renewable energy at a world-beating rate. In this war we're in-the war that physics is fighting hard, and that we aren't-winning slowly is the same as losing. "It would be a grave mistake for the United States to wait for another nation to take the lead in combating the global climate emergency," the Democratic platform asserts. "We are committed to a national mobilization, and to leading a global effort to mobilize nations to address this threat on a scale not seen since World War II." The next president doesn't have to wait for a climate equivalent of Pearl Harbor to galvanize Congress. Much of what we need to do can-and must-be accomplished immediately, through the same use of executive action that FDR relied on to lay the groundwork for a wider mobilization. The president could immediately put a halt to drilling and mining on public lands and waters, which contain at least half of all the untapped carbon left in America. She could slow the build-out of the natural gas system simply by correcting the outmoded way the EPA calculates the warming effect of methane, just as Obama reined in coal-fired power plants. She could tell her various commissioners to put a stop to the federal practice of rubber-stamping new fossil fuel projects, rejecting those that would "significantly exacerbate" global warming. She could instruct every federal agency to buy all their power from green sources and rely exclusively on plug-in cars, creating new markets overnight. She could set a price on carbon for her agencies to follow internally, even without the congressional action that probably won't be forthcoming. And just as FDR brought in experts from the private sector to plan for the defense build-out, she could get the blueprints for a full-scale climate mobilization in place even as she rallies the political will to make them plausible. Without the same urgency and foresight displayed by FDR-without immediate executive action-we will lose this war. Normally in wartime, defeatism is a great sin. Luckily, though, you can't give aid and comfort to carbon; it has no morale to boost. So we can be totally honest. We've waited so long to fight back in this war that total victory is impossible, and total defeat can't be ruled out. In California, thousands of homes were threatened in a wildfire described by the local fire chief as "one of the most devastating I've ever seen." Suburban tracts looked like Dresden after the bombing. Planes and helicopters buzzed overhead, dropping bright plumes of chemical retardants; if the "Flight of the Valkyries" had been playing, it could have been a scene from Apocalypse Now. And in West Virginia, a "one in a thousand year" storm dropped historic rain across the mountains, triggering record floods that killed dozens. "You can see people in the second-story windows waiting to be evacuated," one local official reported. A particularly dramatic video - a kind of YouTube Guernica for our moment - showed a large house being consumed by flames as it was swept down a rampaging river until it crashed into a bridge. "Everybody lost everything," one dazed resident said. "We never thought it would be this bad." A state trooper was even more succinct. "It looks like a war zone," he said.